Dormansland Primary School is proud of its new school. It was opened in May 2002 and provides the staff and children with a bright, airy and modern school equipped for the 21st Century. Up until 2002 the school had existed on two sites with the original school in Dormansland High Street used for Reception through to Year 2, and the school on the Clinton Hill site for Years 3 - 6. By 1884 the average attendance was around 100 children. This represented ‘truancy’ of about 33% but for rather different reasons than today. Poverty often required children to be sent out to work to bring in a few extra pennies and rounding up the absentees was the job of the teacher, not the Local Education Authority! As the village grew in size so too did the demand for a larger school. This led to the building of a second, more modern building, some 200m from the original High Street site. 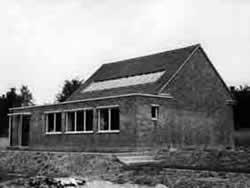 In 1956 the school on the Clinton Hill site was opened, with extensions added in 1993, incorporating much cherry wood into the design (Dormansland was once locally famous for its cherry orchards, hence the cherry symbol for our school). It was used for Years 3 – 6. As time went by it was very apparent that the ‘original’ school was inadequate in a number of ways for school life in the 21st Century. This was recognized by the County Council and so funding was provided for a ‘new’ school, to be on the same site as the more modern school on Clinton Hill. After much planning building work commenced in 2001. In May 2002 the new school was completed and the children and staff were able to have one complete school on one site. Our new building provides us with 7 purpose built classrooms, an ICT suite, library, multi-purpose hall and catering facilities, offices, medical room and outdoor education and play facilities. Despite much change over the years Dormansland Primary School remains very much a village school, at the heart of its community. One tradition that has been kept alive down through the years is the annual Maypole Dance. The pictures below range from 1904 – 1999, but we have continued to celebrate May Day right up to the present.